Photo shared on Twitter by Farida Nabourema @Farida_N. Internet and mobile SMS fell into a total blackout in the West African nation of Togo on the morning of September 7. Anti-government protests have been surging in the capital Lomé, with opposition leaders now demanding that President Faure Gnassingbé step down. On September 5, users began reporting that mobile internet connections were spotty and that social media sites like Facebook were inaccessible altogether. By the morning of September 7, the same researchers told Global Voices that all internet networks (mobile and fixed connections) were down, and that all mobile SMS and mobile money transactions were being blocked. Network testing firm Dyn and West African digital rights group Internet Without Borders, which has members in Togo, verified these reports through technical tests. In a broadcast by Togolese Victoires FM radio station, Public Service Minister and government spokesperson Gilbert Bawara confirmed that the internet had been cut for security reasons. “Even in most developed countries, authorities take control of telecommunications in some cases,” he said. Protesters’ primary objective is to prevent legislators from allowing President Gnassingbé, who has been in power since 2005, to run for another term. The president succeeded his father, Gnassingbe Eyadema, who held power for 38 years. 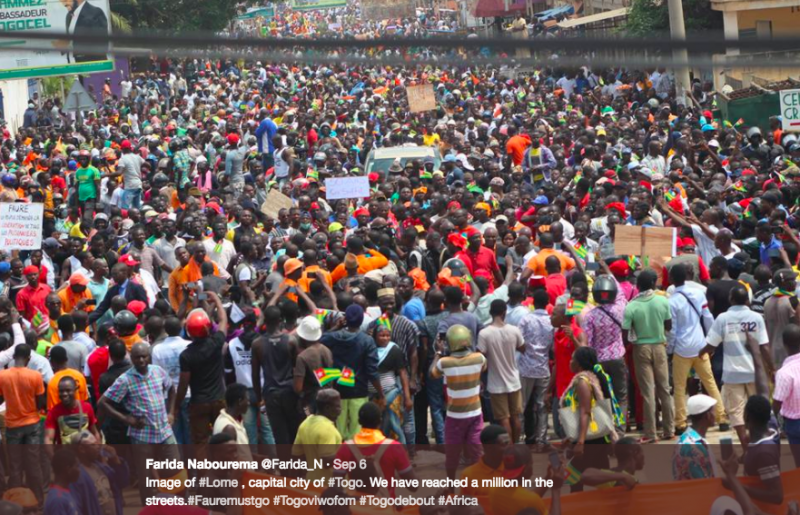 While the shutdown has made it difficult for Togolese demonstrators to report what they’re seeing on social media, blogger Farida Nabourema was sending tweets from the Togo-Ghana border, where she reported that she was able to get a signal. The shutdowns violate international human rights protections for free expression and access to information and contravene a 2016 UN resolution that condemned intentional disruption of internet access by governments. They are also preventing hundreds of local startups and companies from working and delivering their services, simply because their work relies on internet access. A recent Deloitte study demonstrated that an internet shutdown can cost a country up to 1.9% of the daily GDP. Photo of India by jafsegal on Flickr and used with Creative Commons license. why do i feel that some of `us’ are fighting between ourselves? we all know our “biggest enemy”. can we all please concentrate on that? The police investigating her killing have yet to arrest any suspects. Chinese authorities sentenced a man to nine months in jail for selling virtual private networks to circumvent internet censorship. The man was convicted of “providing software and tools for invading and illegally controlling the computer information system,” an unusual characterization of VPNs. Chinese authorities announced a crackdown on unauthorized VPN services earlier this year. At a recent symposium, Chinese Communist Party officials urged the country’s internet firms to strengthen their “party building” efforts. In an effort that is likely intended to enforce greater party control over the internet, tech companies are facing pressure to set up CCP branches, which typically serve an advisory role within the company, though in some cases they may do more. This push may function in tandem with China’s new cybersecurity law, which empowers authorities to shut down sites violating “socialist core values.” At least 34 Beijing-based internet firms now have party branches, including Weibo, Jingdong, Sohu, 360 and Lets TV. Photo by David McEachan on Pexels.com. Sci-Hub, the world’s largest free and open scientific research database, was recently blocked in Russia — though not by Russian regulators. In fact, the website’s founder, Alexandra Elbakyan, elected to block online visitors from Russia due to what she described in a letter posted on Sci-Hub’s homepage as “persecution” that she was facing from Russian scientists who did not want their works to be accessible free of charge. Elbakyan, who is from Kazakhstan, began the project in 2011 in a simple effort to increase access to scientific and medical research in Kazakhstan and other countries where universities often do not have access to large western-owned research databases. A Twitter user in Japan was banned from the service for making a death threat against a mosquito. His tweet included a picture of a dead insect. Ellery Roberts Biddle, Mohamed El-Gohary, Leila Nachawati, Julie Owono, Nevin Thompsonand Sarah Myers West contributed to this report.